The simple artform of piano and guitar with electronic onkyo ambience make us the sense of wonderful seasons. ironomi - 閑森（Shizumori) - 0:00 � 00.00 Buy this Song ! 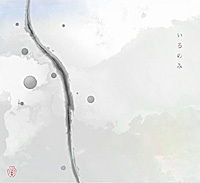 ironomi - 桜灯(Sakura-akashi) - 7:38 � 00.00 Buy this Song ! ironomi - 霧時雨(Kiri-Shigure) - 12:52 � 00.00 Buy this Song ! ironomi - 虹(Niji) - 2:12 � 00.00 Buy this Song ! ironomi - 花(Hana) - 2:35 � 00.00 Buy this Song ! ironomi - 彩夏(Saiaka) - 7:40 � 00.00 Buy this Song ! ironomi - 蟲木(Mushigi) - 6:23 � 00.00 Buy this Song ! ironomi - 想架(Omokage) - 9:37 � 00.00 Buy this Song ! ironomi - 夜想1-I(Nocturne1-I) - 1:36 � 00.00 Buy this Song ! ironomi - 夜想1-II (Nocturne1-II) - 2:31 � 00.00 Buy this Song ! ironomi - 夜想1-III (Nocturne1-III) - 1:21 � 00.00 Buy this Song ! ironomi - 日だまり(Hidamari) - 3:12 � 00.00 Buy this Song !